One of the oldest still operating state schools in Queensland has recently celebrated its 150th anniversary. 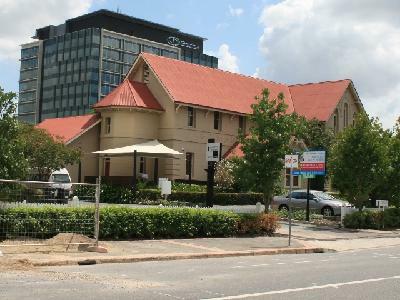 The Fortitude Valley State School was opened in March 1861, operating firstly from the Foresters' Hall on the corner of Ann and Brunswick St, now the site of the Royal George Hotel. Here is a photograph that shows the early school building. By 1867 the school had well and truly outgrown the one-roomed rented premises, and moved to purpose-built accommodation in Brookes St. It is a testament to the local community that over £100 was collected by subscription to supplement the government's cost of building the school. The new brick building was designed by Benjamin Backhouse, and consisted of two storeys. As the Fortitude Valley area flourished further room became necessary, and in 1874 RJ Suter was called upon to design another school building. This one was also brick, and was built in Brookes St between the Backhouse building and the Valley police station. The male pupils were moved to the new building while the girls and infants remained. Further changes that evolved over the years allowed the inclusion of an infants' wing and classes for "Opportunity" students. In 1950 a new building was erected on the other side of the railway line from the earlier buildings. This brought about co-ed classes and the incorporation of the infants' school into the main school body, with the Opportunity students housed in a separate annexe. Fortitude Valley State School now operates out of only the 1950 building, with the other two remaining buildings now privately owned and heritage protected. (Note: the original text has been altered to correct some factual errors). Let me be the first to comment, if only to correct/clarify a couple of points: The Fortitude Valley State School began as a National School (ie government) in 1861 in the rented "shed" that is shown in Photo #1. The seat of education ie the school per se (not the buildings)is BRISBANE'S OLDEST SURVIVING AND STILL OPERATING STATE SCHOOL. It is not Queensland's oldest. Photo #2 is the first purpose-built school and opened in 1867. It was decommissioned as a school at year's end in 1949. 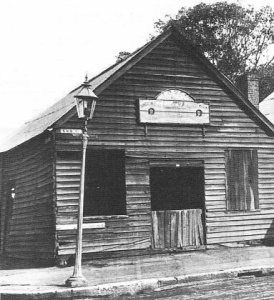 It functioned firstly as a "mixed" gender school until the boys were moved in 1874 to a new school house which was built between the Valley Police Station and the 1867 building. See your photo #4. From 1887/88 the 1876 building became the Fortitude Valley Girls' School and remained as such until 1949. Your photo #4 was the first Boys'(only) School. The second Boy's (only) School was built in 1886 and occupied circa May 1887 whereupon the infants transferred from the girls' department to the vacated (first) Boys' School. The infants remained there until June 1951 when they amalgamated with the "mixed" or co-ed school in a new building that opened in January 1950. The second Boys' School (1887) included Opportunity mixed gender classes from 1923 separate from the mainstream boys. The Fortitude Valley Opportunity School was under the umbrella of the mainstream school and did not exist as a separate entity until 1951/52 when it occupied an annexe behind the 1876-built school house. The second Boys' School (1887) was dismantled and removed in 1948/49 when a new school building replaced the 1887 school house from 1950 - see your photo #3. Your paragraph beginning "Further development occurred in 1887" incorrectly references the 1874 building. The sentence "The former boys' school building is still operating as a state primary school" is incorrect too. The 1867 building was occupied by the Correspondence School (no children in attendance) for a number of years after closure of the Girls' School and before being occupied by the State Emergency Service. This comment from TeamT arrived while I was overseas and didn't have the means to check the detail in my original post about this terrific old school. I thank the writer for taking the time to provide such full information. It appears that I have indeed mistaken the various buildings and the timeline of the school's history. Naturally, I want the blog to be accurate in its descriptions and I have done my best to correct the post. I taught at FVSS from Jan 2001 to Dec 2003. By then it was a 2 teacher school and during my 3 years there the number of students peaked at 39. I taught Years Pre school to Year 3. Both classrooms were on the top floor of the building, with Behaviour Management Unit in the middle floor which served most of north Brisbane. I've seen photos of wooden classroom blocks that used to be behind that big brick building which helped house the 1000+ students in its heyday.